Dry stack cultured stones are created from concrete molds to resemble natural rocks. 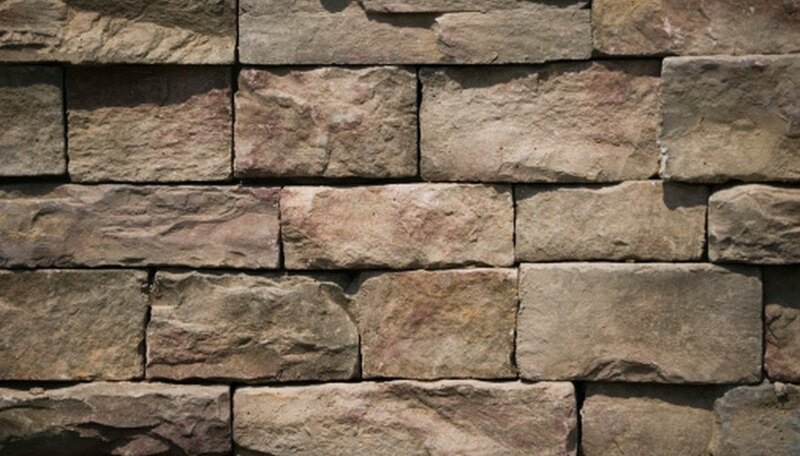 Installed as a wall, the stones create the appearance of full-size dry stacked stones, even though the molded stones are a stone veneer a few inches deep. The installation process creates the dry stacked illusion. Mount the stones with no spaces between them, giving the appearance of stacked stones. Unlike traditional dry stacked stones, the cultured stones are held in place by the mortar behind them rather than the weight of the stones. Clean the surface on which the cultured stones will be installed, using soap and water. Use a sponge to remove dirt and debris, and a scrub brush to remove caked-on dirt. Rinse the surface with clean water. Cover the surface with an 18-gauge metal lath secured by nailing it to the wall with 2-inch nails every six inches across the lath surface. Where separate lath pieces meet, create an overlap of two inches at horizontal seams and six inches on vertical seams or when you cover a corner with the material. Cut the lath where needed with tin snips. Mix a batch of mortar in a large bucket containing one part portland cement, two parts masonry sand and enough water to bring the mixture to the consistency of peanut butter. Use an electric drill with a paddle bit to mix the mortar as you add the water to the dry ingredients. Spread the mortar over the lath and onto the subsurface using a trowel. Push firmly on the mortar to ensure that it goes through all holes in the lath and sticks to the surface beneath before covering the lath with a thin mortar layer. Scratch the surface of the applied mortar horizontally with a mason’s scratcher to give it texture for the application of the stone adhesive. Let the mortar dry for 48 hours. Mix a second batch of mortar consisting of three parts portland cement, two parts thinset mortar and seven parts masonry sand. Substitute latex modified thinset for an exterior installation. Set the cultured stones into the mortar beginning at the bottom of the wall and working upward in rows across the wall length. Place a layer of mortar about half an inch thick on the rear of each stone before placing it onto the wall. Use a slight wiggling motion when placing the stones for a better grip on the wall, then remove any excess mortar from the wall with the trowel edge. Leave no space between the stones, resulting in no need for grouting. Wipe away excess mortar on the face of the stones with a damp sponge as you set them in place. Wait 48 hours for the mortar to begin to set. Spray the surface of the wall, both the stones and the mortared joints, with a concrete sealer to protect the wall from moisture stains. .
Color the mortar with pigment to match the stone before setting the stones in place to help hide the mortar layer and increase the illusion of natural dry stack stones. Wear safety goggles, a face mask and work gloves when handling the mortar to avoid contact with the chemicals in the mix.